*to a mentally unstable, baseball-obsessed 21-year-old girl. Yesterday my world came crashing to halt when I found out that I had been betrayed by my first true love. Jacoby Ellsbury signed a seven year deal with the Evil Empire. Of all the teams in all of baseball, he signed with the damn Yankees. Jacoby is going to be donning pinstripes and making $153 million for 70% of the next decade. To a 21-year-old college senior, seven years is far beyond the foreseeable future. It will go to the end of the 2020 season and I will be half way dead. My friends might be getting married and having children within that time. Poor, unfortunate children who will be born into a world where Jacoby plays for the wrong side of baseball’s greatest rivalry. Think of it this way, seven years ago it was 2006. There had never been a black president or an iPhone and skinny jeans were just introduced into the fashion world. The #1 single of the year was “Bad Day,” The Departed won the Academy Award for Best Picture and That’s So Raven was still on the Disney Channel. Britney Spears had never been bald, Robert Pattinson was not a sparkly vampire and Justin Bieber was just a random 12-year-old in Canada. IT WAS A COMPLETELY DIFFERENT WORLD. Seven years might as well be forever. The Yankees have single-handedly ruined the next seven years of my life. What am I supposed to do with all of my Jacoby Ellsbury paraphernalia? Can I wear my Ellsbury jersey? Can I hang my autographed photo? Can I drink my Zinfandellsbury wine? Do I have to take him off my wall of men? How am I supposed to forget the last six years of love and happiness we shared and shun him as a traitor? That’s six years of emotional and financial investments that can’t easily be erased. No matter what the future holds, the Yankees can’t pay $153 million to change the past. Let’s take a look back on our love story my deep and very concerning delusions. In September 2007 Jacoby Ellsbury was called up from Pawtucket and added to the Red Sox’s 40 man roster. I didn’t know anything about him except that he was a rookie and as fast as a leopard. I always had a soft spot for rookies and I loved him before I was in love with him. He was Rookie of the Month for September and lit up the ALCS and World Series as the starting center fielder. When I watched a playoff game on my Uncle’s HD TV, I realized what a babe Jacoby is and that’s when I began to lose all remnants of my sanity. To top it all off, he won free tacos for all of America. How could you not fall in love? I went to the parade and displayed my love for him. May 21, 2008 I went to my first Red Sox game and since Jacoby knew how special it was to me, he hit me a home run and the Red Sox won the game. 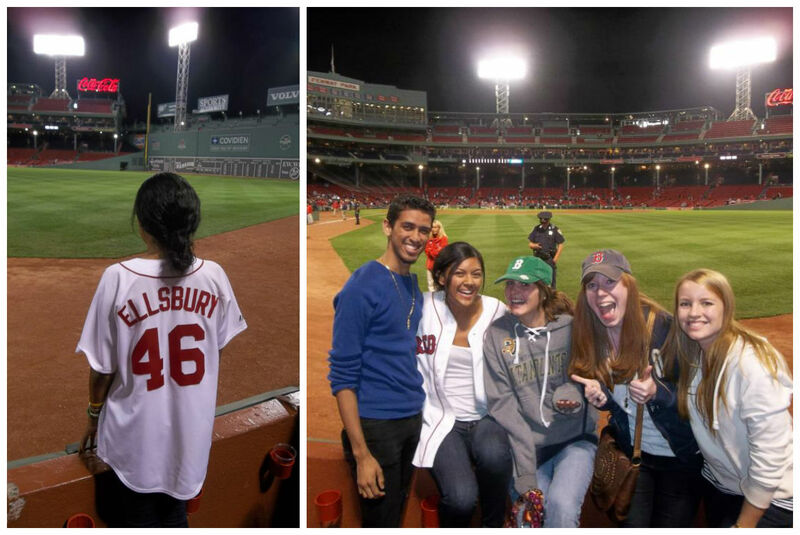 September 11, 2012 my friends and I went to the Red Sox game on Jacoby’s birthday. Even though the Red Sox were completely out of the running for postseason, it was a great game. Jacoby hit a walk-off to beat the Yankees. I nearly died. Jacoby played like the all star he is throughout the 2013 postseason. My mom and I went to ALCS Game 6 where I first found that he changed his walkout song. When I heard “Niggas in Paris,” one of my favorite songs, I lost my mind. It was another sign that we were meant to be together. During Game 6 of the World Series we watched Jacoby’s last at bat in a Red Sox jersey and there was some memorable base running to go along with it. Then the season ended. Jacoby was a free agent and he would not be returning to Boston. I tried to mentally prepare myself to bid adieu to my favorite Sox player. He wasn’t my favorite just because he is a major babe (Major Babe), my boy has mad baseball skills. The Yankees aren’t paying him $153 million for his good looks. At his best, Jacoby is a superstar on the field. I miss him already. Now my first celeb husband plays for a team I hate with the fire of a thousand suns. So if you need me, I’ll be listening to “Someone Like You” and crying for the next seven years. Oh, and by the way the Red Sox are the 2013 World Champions. Isn’t the world a glorious place? Let’s go back to the day of game 6. I was a hot mess. From the moment my eyes opened that morning, I knew that it was going to be a long day. The World Series was on the line. We were one win away from the rings, the parade, the DVD…it was all so close but not yet within arms’ reach. We were one win away from winning in Boston for the first time in almost 100 years. Would the Red Sox be able to pull it off tonight? Or would the Cardinals force a game 7 where anything could happen? This city did not deserve the heartbreak of losing a game 7 and I couldn’t handle the stress of having a game 7 at all. That night, after several attempts, my friends and I finally found a place that wasn’t overrun by anxious fans and had enough TVs so that everyone could watch the game. We all settled into our table at Sunset Cantina and prepared ourselves for a long night of baseball and a roller coaster of emotions. As it turns out, the roller coaster only went up. There were no dips or turns, we just kept soaring higher and higher until the victory was ours to celebrate. The ninth inning began and we all watched to see if Koji would be everything he had been, a shutout closer. He was. I cried. It was magical. The following Saturday my friends and I headed to Boylston at the crack of dawn to secure front row spots at the Rolling Rally. The bearded duck boats rolled down the street and you could feel the excitement in the air. Jacoby Ellsbury hoisted the trophy up for all to see, Koji Uehara and Junichi Tazawa threw bracelets out to the crowd, Jonny Gomes stuck out his beard and everyone loved it. But, the best part was when the parade paused at the marathon finish line and none other David Ortiz walked no more than three feet from where we were standing. He got down from his duck boat to say a few words on the float where the Dropkick Murphys were playing. After he made his speech, he sauntered by us one more time and I was in the presence of greatness. It was the closest to royalty I’ve ever come. The parade eventually came to an end and marked the close of the 2013 season, leaving us to bask in it’s glory and wait to see what 2014 will bring. THE RED SOX ARE THE 2013 WORLD SERIES CHAMPIONS. I can’t say that enough. 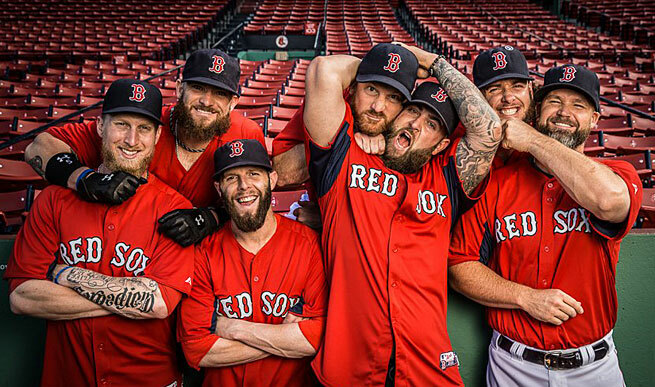 Our motley crew of bearded warriors battled their way from worst to first in a season that won’t be forgotten by the people of Boston or throughout all of Red Sox Nation. Here is the perfect playlist to keep that emotional high and to tell the story of the 2013 World Series Champions, the Boston Red Sox. The theme song for the Sox this season. The lyrics are literally “started from the bottom, now my whole team here.” Grammar aside, lyrics couldn’t be any more perfect for this team. The Red Sox have said time and time again that this World Series was for us, for Boston. Don’t worry about a thing, ’cause every little thing gonna be all right. When Shane Victorino comes up to bat all of Fenway Park joins in singing those words, and when Victorino hit that grand slam in the ALCS the song reached a whole new level in the hearts of Sox fans. 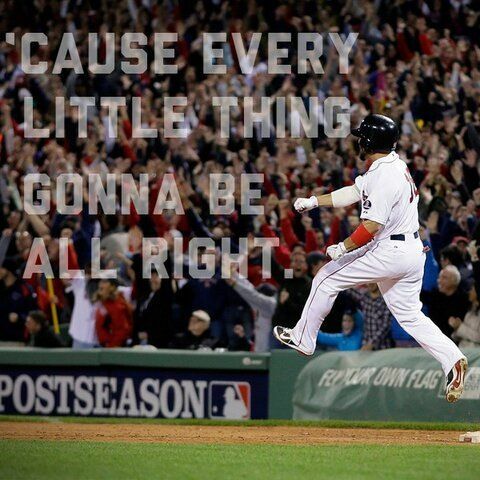 Boston’s favorite X-Man, rookie Xander Bogaerts gave it all throughout the postseason. The youngest playoff starter in Red Sox history has left quite a mark in Boston and fans can’t wait to see the kind of career he is going to have. A Fenway Park classic. You haven’t lived until you’ve yelled “SO GOOD! SO GOOD!” in the middle of the 8th inning with 37,399 other fans in America’s most beloved ballpark. Another classic Bostonian anthem. There are few things better in life than hearing this song played in Fenway Park after a Red Sox win. If this song doesn’t get you pumped then all hope is lost. This is nothing short of amazing. Ylvis pondered what does the fox say, but this finally answers what the Sox say. Country artist Tim Montana turned his own catch phrase and inside joke “this beard came here to party” into a song which became another anthem for the 2013 Red Sox. While not originally written for the Sox, the song is perfect for this season. Q: What is better than going to a Red Sox game? A: Going to a Red Sox game for FREE. It’s (probably) a scientific fact that things are better when they are free. 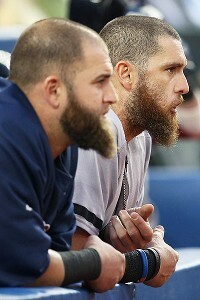 In honor of Red Sox players embracing their beards (I’m looking at you Jonny Gomes and Mike Napoli), Fenway had a special $1 Beard Night. Anyone who showed up with a beard, real of fake, had the opportunity to buy a ticket to that night’s game for $1! So, we showed up with our beards and our dollar bills and got in line behind many other dedicated, bearded fans. PLOT TWIST: The tickets were not $1, they were completely free! My friends and I walked into Fenway expecting cheap nosebleeds in the bleachers and we were happy for it. Surprisingly, our tickets were for the grandstand behind home plate! They were great seats despite having an “obstructed view” (stupid, support beams). But if you ask me, it’s always a good seat if you’re in Fenway. At the end of the first inning we were all watching a montage of awesome plays and fans on the jumbo tron when the most magical timing in the history of the world happened. My friend, Megan, said “I wish I was in montage” and then I said, “I wish was in a montage too!” THEN I WAS IN THE MONTAGE. It was a flawless moment. Last season my friend and I were on the jumbo tron when were doing spectacular choreography to “Love Shack” and now it’s in a montage that plays in Fenway Park! It’s like I’m at every Red Sox home game. At the end of the seventh inning, my friend who works for the Red Sox came out and took all of us up to the Green Monster. THE. GREEN. MONSTER. 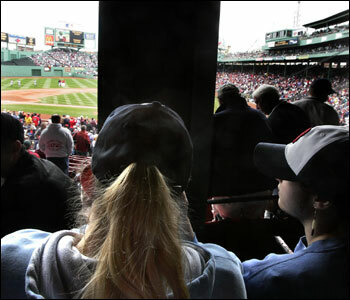 For those of who don’t know, Green Monster seats are coveted by all of Red Sox Nation. When we got up on the Monstah it was just in time for the middle of the eighth inning AKA time for “Sweet Caroline.” Joining thousands of fans in a Fenway Park tradition from the best seats in the house was beyond incredible. In that moment, I swear, we were infinite. After “Sweet Caroline,” I got watch five innings with the greatest view in all of Boston. There is nothing like watching baseball from the top of the Green Monster. Even though my boys lost in extra innings, it was one of the most electric nights of my life (including that time I saw Nick Carter hip thrust). It’s also worth mentioning that now the Red Sox have the American League East title. This is important mainly for two reasons: 1. THE RED SOX OWN THE EAST; 2. I am officially not bad luck for the Red Sox! 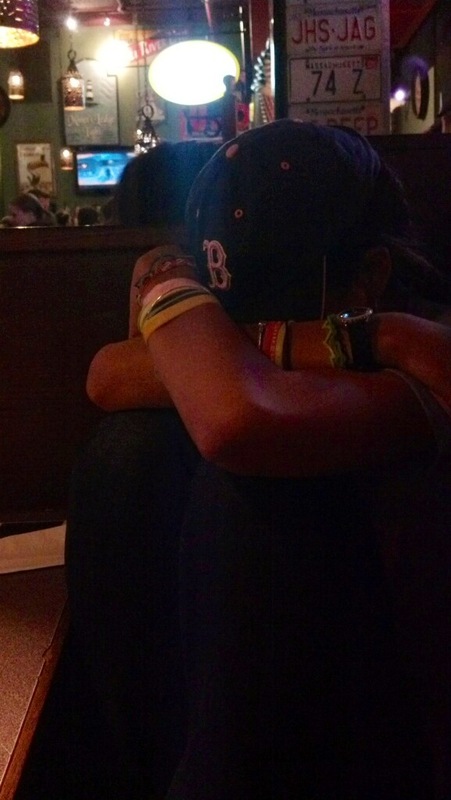 Since I moved to Boston (with the exception of this year) the Red Sox have not made it to the playoffs. I was seriously concerned that I was going to have to leave Boston because I certainly could not keep the Red Sox from October baseball indefinitely. Thankfully, that is not the case. 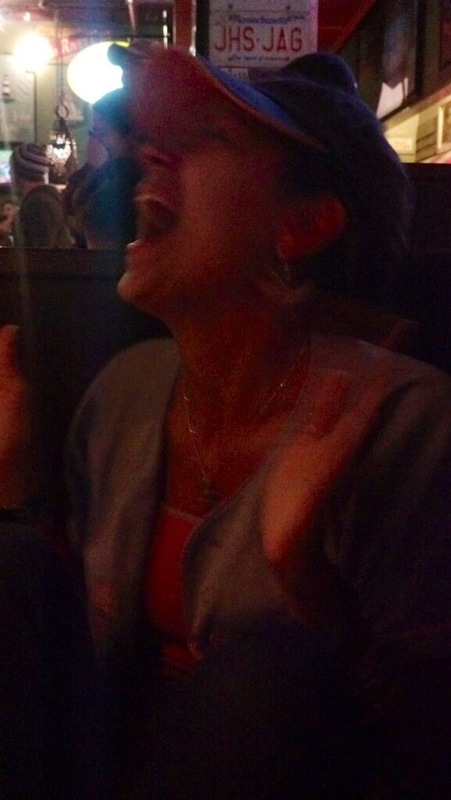 My beloved Red Sox are going to the playoffs and I can stay in Boston! stay gold & go Sox!